In the early 1980’s, talented young architects in the Soviet Union secretly gathered to undertake important civic and public projects they were excluded from entering in the culturally repressive USSR. 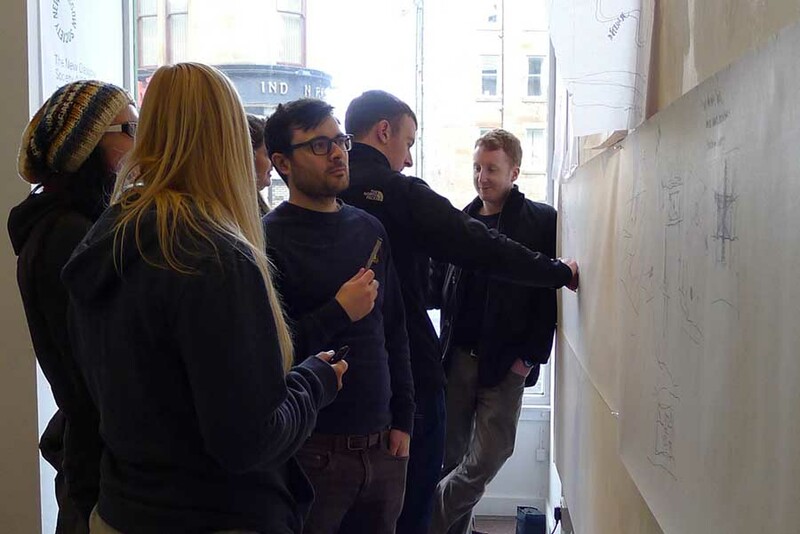 Last Saturday a group of 20 very talented young Scottish Architects, including Anna Gibb and Ross Anderson who represented the UK in the British Pavilion at the 2012 Venice Biennale, met for a day to consider the future of George Square. This is a brief a record of the enthusiastic, productive and eventful day and includes their photographs, discussions, work and drawings. 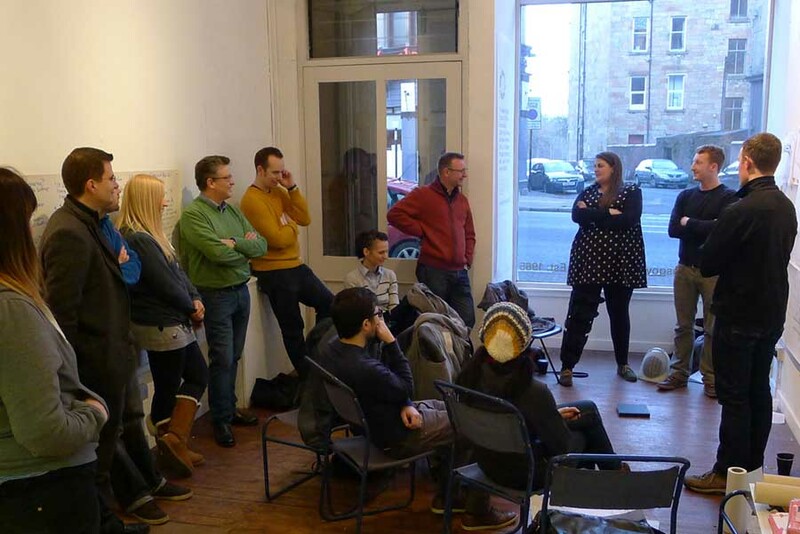 On Saturday 19th the inaugural Paper Salon was held in Glasgow, hosted by the paper+ architects. 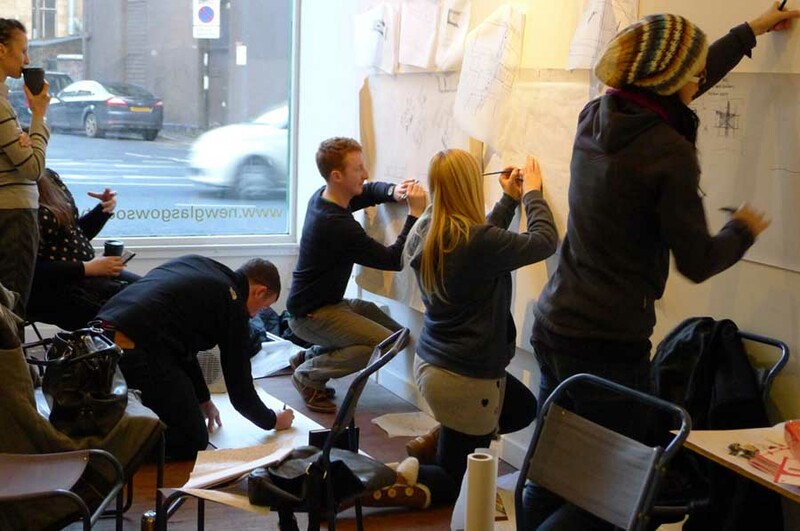 The mission:- to provoke a positive and creative response to the recent design competition to reimagine Glasgow’s George Square for the 2014 Commonwealth Games. George Square is Scotland’s largest public space and has long been the subject of debate. The Paper Salon started with a site visit, and discussion of aims of paper architecture and its role in exploring architectural ideas related to the design of public/civic space in the UK today. This was followed by a design esquisse which culminated in reviews with a panel of invited guests, including Alan Dunlop and Patricia Cain. The principal aim of the day was to get together a group of creative individuals, who would not normally have the opportunity to work together, and outside of an office environment. 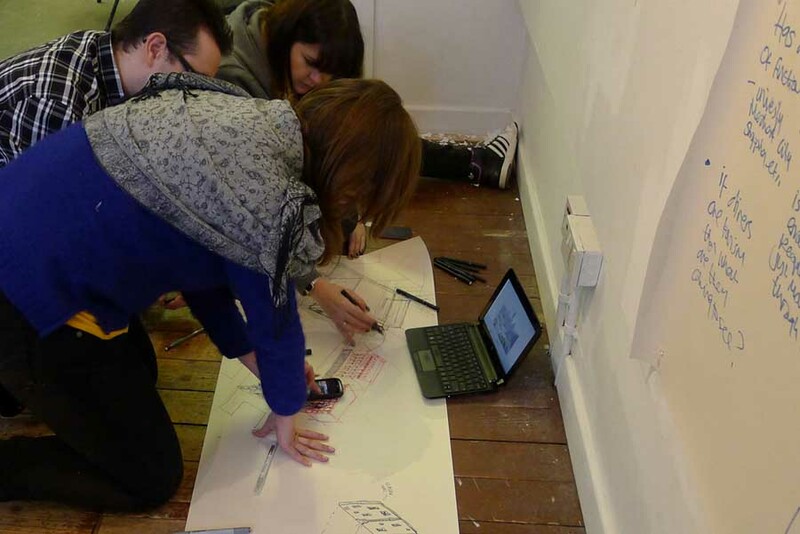 Participants were encouraged to challenge the brief as set by Glasgow City Council and to provide imaginative responses uninhibited by the usual competition process. The day resulted in 4 completely different ideas – all posing imaginative and challenging suggestions, and was thoroughly rewarding for all. 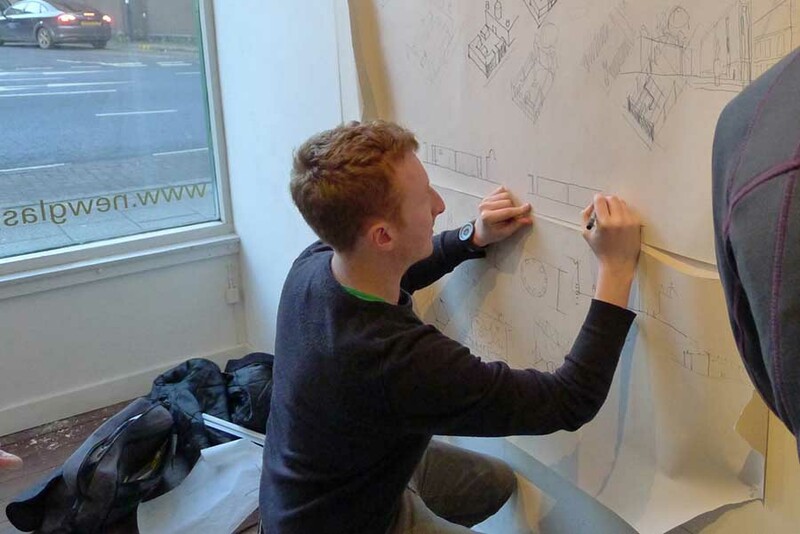 paper+ architects is a project born of the 2012 Venice Biennale, founded by Ross Anderson and Anna Gibb. Anna and Ross travelled to Russia to investigate a loose collective of young architects who lived in Moscow in the 1980s and called themselves ‘the Paper Architects’. The group, which included Alexander Brodksy and Ilya Utkin, sought to escape the restrictions that came with working under a communist regime by entering projects in ‘forbidden competitions’. The Paper Architects tackled issues they faced in Soviet Moscow with fanciful and provocative solutions. By shedding light on alternative modes of practice, the exhibition in Venice sought to demonstrate the common ground of architects internationally. The hope is that the proposals will influence debate in the UK, provide an injection of fresh ideas and open up international dialogue. George Square has acted as a catalyst for social expression over the past 150 years. In recent times however, the square has declined in stature to a point where its mere relevance is being called into question. To assign blame to this unfortunate outcome is pointless and we must first assess our own interactions with our fellow Glaswegians and how, as a community we can make George Square a prestigious Civic space that reflects the energy of the city. Instead of inspiring designers and the community alike to reinstate George Square’s prestige, we have aspired to create a space that will in turn rouse a social energy within Glasgow that is lacking in recent times. In erecting 20m high mirrored panels, we have encouraged the community of Glasgow to act on their curiosity and investigate the hidden drama within the square. We have also taken the bold decision to reduce the area of the square as to magnify the impact of public gatherings, from demonstrations to celebrations and to amplify the captured energy throughout the framing streets of George Square. In a playful social experiment, we have proposed that all statues become moveable through a rail / counterbalance system, to encourage interaction between strangers and to break the social boundaries that exist in modern society. 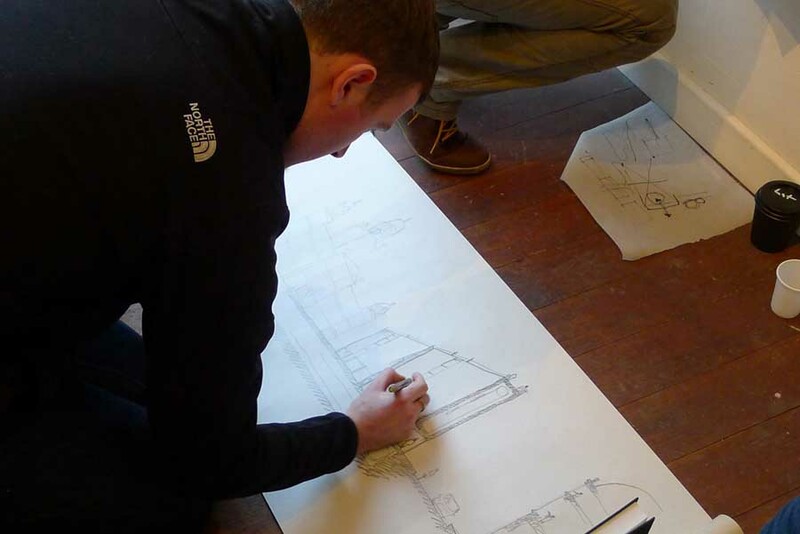 We had to first establish what the main issues were with the current design of the square. The main issue which has a detrimental effect to the current layout is the fact that it is isolated by roads, obstructing pedestrians from passing through. Therefore our first move was to pedestrianise the square, diverting traffic to the adjacent streets and also pedestrianising North Hanover Street creating a link from Buchannan Street bus station, through George Square to the Merchant City, which will allow restaurants and bars to spill out onto the streets creating an exciting and vibrant route through the city. 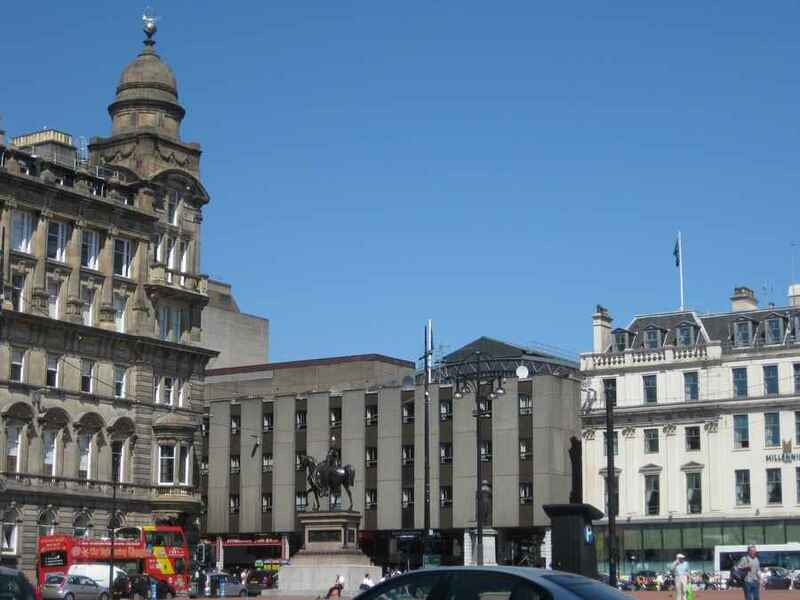 Our second big move was to demolish the Millennium Hotel to create a new grand entrance to Queen Street Station, replacing the three current smaller entrances, meaning that George Square becomes the main arrival point for thousands of people on a daily basis. We felt that these moves were enough to greatly increase the amount of people using George Square, either as a through route or as a space to break out from the busy commercial areas. Combined with a general ‘facelift’ such as new paving and seating, George Square will become a place for everyone to enjoy. The question of George Square is how to bring people into it, through it and around it. Inspired by the amorphous route of shoppers from argyle st in the 1980s, along a pedestrianised Buchanan Street up to Buchanan Galleries in the early 2000s, our aim was to reclaim the square from the over commercialisation of Buchanan street and to reinstate it as the heart of the city. Furthermore, the desire to capitalise on the potential of Queen St station as an arrival point with a sense of occasion. In a bold move, and toying with the idea of breaking Glasgow’s victorian grid, we explored the idea of removing the buildings between the square and Buchanan Street, which act as a wall. We discussed 2 options;- the removal of part of the block which conceals the entrance to the station, opening up vistas and creating a new wall of statues, mirroring the theatre of the City Chambers. The second option was to removes the block entirely. What would happen if the square had a Buchanan Street frontage? Opening up the square, flooding it with people, and creating a dramatic arrival befitting of Scotland’s largest city. 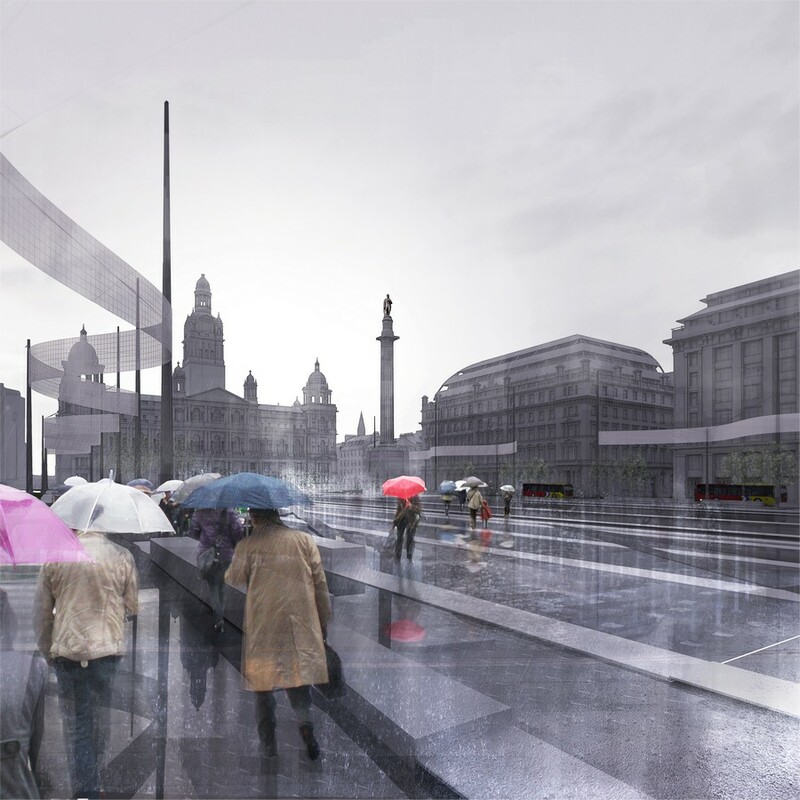 Our proposals sought to take the tired and cluttered George Square that we see now and revitalise it through a combination of subtle and meaningful alterations. We wanted the square to be brought back into the civic heart of Glasgow; to make Glasgow proud of it’s grand and urban fabric. We proposed to retain George Street as the main thoroughfare in this area and pedestrianise the three other sides of the square; thus enabling traffic flow while allowing for the safe gathering of large groups of people. The existing red tarmac, so detested by the locals, would be ripped up and a new unifying material would be laid on the larger concourse, linking both the City Chambers and the adjoining restaurants onto the square, enabling them to utilise the space as an extension to their premises. The same material would continue down into the main design response; a new sunken amphitheatre which steps down in the centre of the square offering a platform for expression, a place to gather and a seat to view. We envision that the square will be linked to the City Chambers through a new cultural centre, thus offering a transparent connection between the public and those who run the Authority. We proposed to retain the statues, but move them to the outer threshold of the Northern side of the square which would provide a hard edge against the backdrop of the least considered elevations. Our aims were to create a vibrant space in the heart of Glasgow that the locals could be proud of. We sought to do this first and foremost, and the international gesture of a tourist destination would surely follow.